In this article you’ll learn about different strategies for maximising learning and development effectiveness. So what does 70:20:10 look like in the Development Plan? Let’s first look at a typical development plan. The employee has identified a need to develop their presentation skills. The plan includes a formal training course and watching a video. 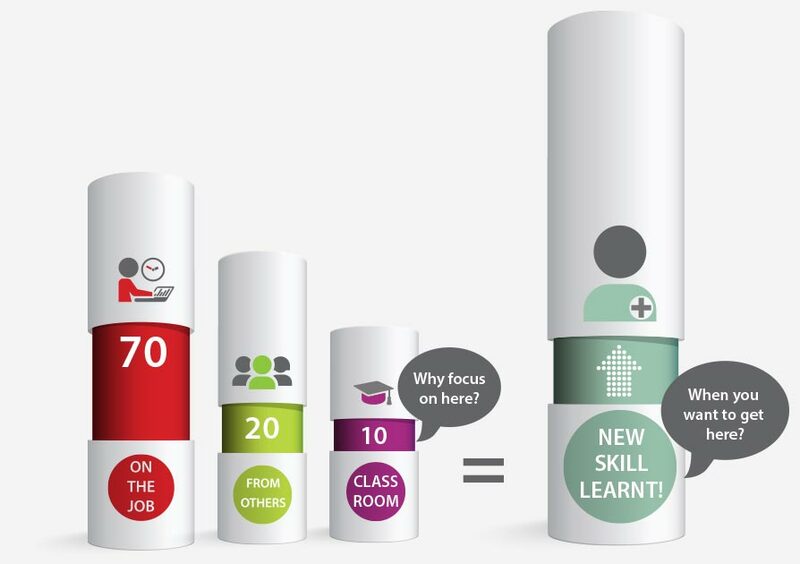 By applying the 70:20:10 principle, we can quickly see that this development plan only covers 10% of what’s required to learn a new skill. What does this mean for the return on investment for your training budget? The answer is, it’s hard to tell. Got some great tips about how to structure and deliver a good presentation. Also covered body language, which was very interesting. This video reinforced some of the content covered in the training course. Interesting to know even famous speech makers use a similar technique. Now let’s look at a development plan using the 70:20:10 principle. The first obvious point of difference is the increased number of activities. They cover self reflection, observation and practice. For the business the return on investment for the training course is evident. The final activity saw the employee give an outstanding presentation at the company’s annual investor’s briefing. Reflect on some of the specific skills you would like to work on (e.g: eye contact, stop saying ‘um’, how are slides best used?). Make note of why you think these skills are important, and what you would like to learn from the upcoming training session. Posture: I feel that posture is very important for projecting confidence, and this is something I don’t pay enough attention to. Speed of speech: I tend to talk very fast when I get nervous. It would be good to learn some techniques on how to deal with this. Content of presentation: I find it very difficult to find the right balance between giving enough information and covering too much detail. The course covered all the skills I wanted to develop. As well as some very practical tips about how to capture the audience attention and using body language to each person’s advantage. Attend 3 business conferences. Pay attention to how great speakers are applying the skills covered in the Public Speaking course. What are some of the key observations? How could these techniques to adapted to suit my personal style? Would I have done anything different? Attending the business conferences after learning about public speaking skills put the event in a brand new light. It was interesting to be able to pick up on body language cues and techniques the speakers were using. I now understand that there’s no hard and fast rule about ‘the style’, but the key is to find one that suits you. If I was the presenter, I would have included less detail on my slides. This could have prevented the awkward tilt and read situation the last speaker found himself in. Having this opportunity was fantastic. I have developed a lot since last October, and the results are clear. The way my presentation was received was better than I could have imagined. I look forward to continuously developing and pushing myself in this area. Lombardo, Michael M; Eichinger, Robert W (1996). The Career Architect Development Planner (1st ed.). Minneapolis: Lominger. p. iv. ISBN 0-9655712-1-1.